View our current inventory of cell on wheels or contact us to learn more about our leasing and purchasing options. A C.O.W. 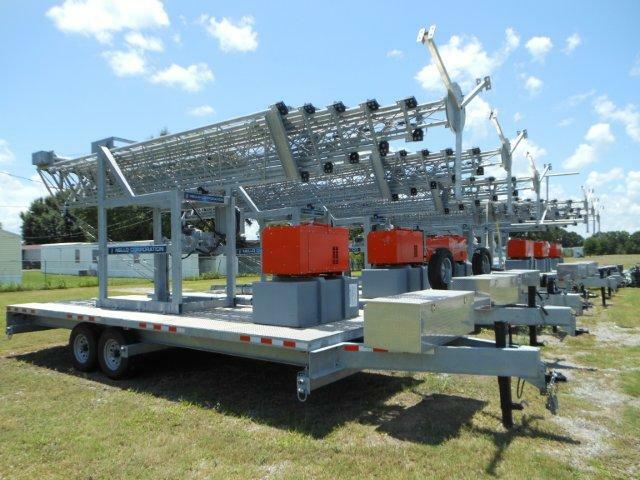 is a common acronym used in the telecommunications industry to stand for “cell on wheels.” The C.O.W is a mobile cell site product that includes a tower and transceiver as well as all other necessary equipment, carefully constructed on a trailer or truck. Unlike standard towers, cell on wheel towers are highly portable and can be used on a short-term basis, since they are not constructed for permanence. However, a high-quality system can be utilized for longer periods of time, if necessary. These mobile towers are usually used to create or boost a cellular network for a brief period, during an emergency, for a big event, or while a full tower is being built. There are many sizes of C.O.W, each designed for different needs, including easy access, more strength or more stability. The smallest versions sit on trailers that can be pulled by nearly any standard truck, whereas the largest versions of a C.O.W require a heavy-duty rig to tow and set up the tower. The larger versions allow for a bigger tower and more power, while the smaller versions are easier to add or remove without as much planning. A cell tower on wheels is used when there is a need for strong cell signals, but only on a temporary basis. Emergency use — such as after a major storm or flood — is one common application. If a standard tower is damaged and requires repair, using a C.O.W. makes sense from a practical standpoint. However, these towers are also used during major occasions such as for the Super Bowl, media coverage of a big event, or a large parade or festival. Additionally, a cell on wheels setup can provide a temporary signal when a standard tower is being built — a process that isn’t always fast enough to keep up with consumer needs. If you need a C.O.W, it only makes sense to work with a telecommunications equipment expert. CellSite Solutions is your source for cells on wheels and any other telecom equipment service you may require. Unlike the competition, CellSite Solutions is focused on your satisfaction, not our bottom line. We want to give you exactly the right product — backed by our knowledgeable team of experts who can help you determine what product is the best solution for your telecommunications needs, both now and in the future. The concept of the cell on wheels platform may be a bit overwhelming to you as a business owner, especially if it is a new concept to you or if you are not sure what size you require. If you would like more information or would like to arrange for the addition of a C.O.W. tower for your business, contact us today. We would love to help you with all of your telecommunications equipment needs.